alaTest zebrał i przeanalizował 626 opinii użytkowników z magazynów i stron. Oceniającym podoba się wygląd i cena. Przenośność jest również bardzo dobra. Eksperci oceniają ten produkt na 81/100 a użytkownicy na 89/100. Przeanalizowaliśmy te oceny, wiek produktu i inne czynniki. W porównaniu do innych produktów z kategorii Kamery wideo, Canon Legria/Vixia HF G10 uzyskał ogólny alaScore™ 91/100 = jakość Celująca. The Canon LEGRIA HF G10 shows the company still has plenty to offer the serious videomaker. The ; delivers great video quality and a lot of useful features for advanced shooters. Design issues that affect frequently used adjustments may annoy the very people the camcorder is designed to attract, and for the money it should ship with a double-capacity battery. While it's got a great shooter feature set and good video quality, the Canon Vixia HF G10 still feels a bit expensive for what it offers. There are full-manual controls, a wide range of cinematic filters, and excellent low-light, feature-worthy performance. But it's spendy. The Canon Vixia HF G10 delivers great video quality and a lot of useful features for advanced shooters. Provided you've got a wallet padded enough to take the blow, the Canon Legria HF G10 is an excellent high-end camcorder with a wealth of features. A beautifully made high-end camcorder, but we don’t think its image quality matches its price. 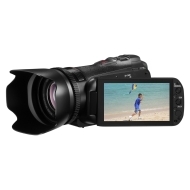 Designed to match the creative passion of experienced videographers, the LEGRIA HF G10 features professional quality Canon components and extensive manual controls for exceptional HD movies.. Designed to match the creative passion of experienced videographers, the LEGRIA HF G10 features professional quality Canon components and extensive manual controls for exceptional HD movies.